The other day I was in a hurry to check the status of a flight I was taking later that week. I needed to know if I could fit in an appointment before leaving for the airport. When I went onto the website this is what I got. For a company of this stature, and for a company that transacts online at this kind of scale, I find this flabbergasting. Such a website shouldn’t ever be down, certainly not at peak hours. This was 17:00 on a week day. When I worked in the cyber-security business, the standard service level agreement for a cloud-based service was what they call ‘five nines’, or 99.999% availability. In some quarters, four nines wasn’t seen as sufficient for an enterprise’s mission-critical systems. To put this in perspective, five nines availability allows for total unscheduled downtime – assuming uptime is calculated on a 24/7/365 basis – of just six minutes, for the entire year, if my calculations are correct. Which leads me to conclude either that this is one of those moments of unforeseen torture for a company that sets itself the highest standards of transactional availability, or that the company is in fact a bit sloppy or laissez faire with its customers’ goodwill. 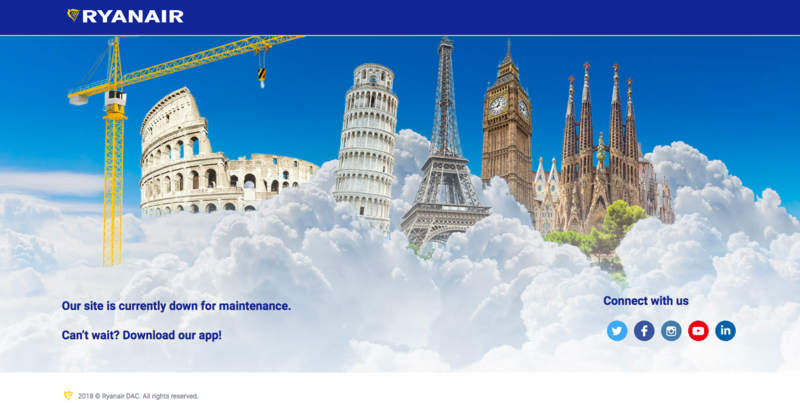 In the time it’s taken me to write this post, I checked back on the site and it was back up, so perhaps we can give Ryanair the benefit of the doubt on this occasion.